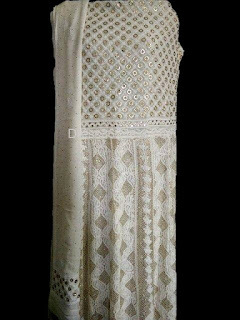 Chikankari ( Lucknowi Chikan hand embroidery) is a elegant and beautiful hand embroidery on a variety of textile fabric like Cotton, Georgette, silk, chiffon, organza, net etc. it has been practiced from last 400 years and it became a tradition. Over a period of time, it has evolved and became a commercial activity and giving employment to many artisans. It Started with White thread embroidered on cool, pastel shades of light muslin and cotton garments. 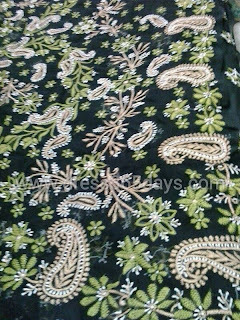 But currently chikan embroidery is also done with coloured and silk threads in different colours to meet the recent fashion trends and keep chikankari trendy with fashion. 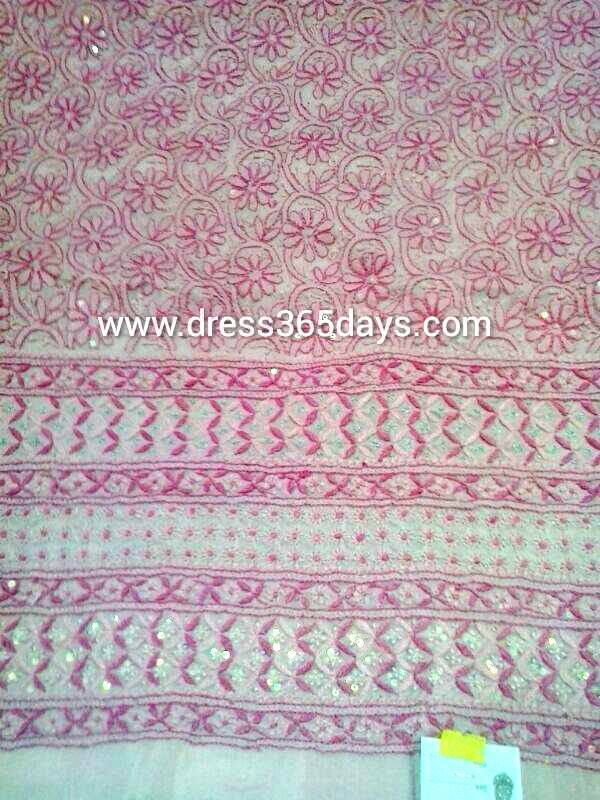 Western Wear Chikan embroidery are well in Fashion. Lucknow is the heart of the Chikankari industry today (Lucknowi chikan). Stitching: Then a quick running stitch is done to give the block printer an idea of the placement of the designs to be printed. Embroidery: The embroidery is done on the printed designs. Different people specializing in different kinds of stitching contribute to the finished embroidery. Washing : This is very important. After the garment goes through the preceding steps it becomes so dirty that the finer flaws are not seen unless it is washed. Finishing: Clipping extra threads, fixing any flaws, and putting finishing touches on garments are some of the final steps. Chiffon is the French word for a cloth or rag, is a lightweight, balanced plain-woven sheer fabric woven of alternate S- and Z-twist crepe (high-twist) yarns. The twist in the crepe yarns puckers the fabric slightly in both directions after weaving, giving it some stretch and a slightly rough feel. Chiffon is made from cotton, silk or synthetic fibers. Chiffon can be dyed to almost any shade, but chiffon made from polyester can be difficult to dye. Under a magnifying glass it resembles a fine net or mesh which gives chiffon some see-through properties. 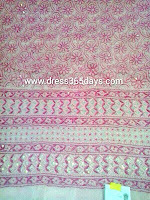 Lucknow Chikankari Embroidery and Gotapatti Here are few Lucknow chikankari embroidery work with gotapatti mirror work. You can get these beautiful pieces from Dress365days website. "We would like to experiment and create different types of fusion work blending chikankari embroidery from lucknow with gota, mirror , mukaish kamdani wire work. Sometimes we use pearl also" says Anchal Gupta owner , Dress365days. "We sell all our products through online and only from our website. We don't have any other presence expect Bangalore and Lucknow."